Three summers ago, I stood with three other women in a shady Jerusalem courtyard overlooking the Dome of the Rock. We had just been separated, like goats from sheep, from the 27 others in our tour group, and instructed with a terse hand gesture to walk half the length of an American football field to await further instructions. As we stood in silence and exchanged raised-eyebrow glances, we wondered what unnamed crime we had committed. 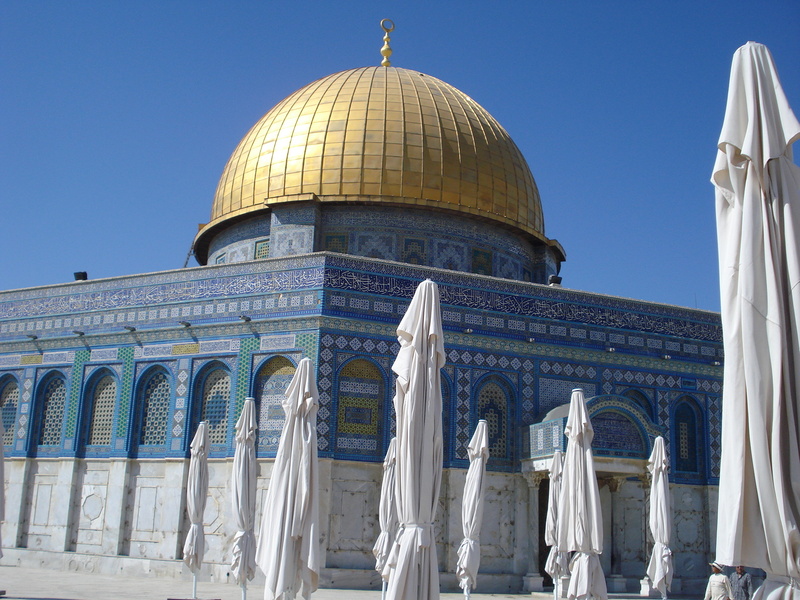 The Dome of the Rock, the original site of Solomon’s temple, is the holiest site for Muslims which literally occupies the holiest site for Jews. This ornate shrine is positioned within the Old City gates of Jerusalem, and it stands above what we often call the Wailing Wall, the Western Wall of that original temple. Christians also visit this site regularly, following in the footsteps of Jesus of Nazareth, who more than 2,000 years ago both worshiped and overturned tables in that temple. After Jesus’ death and resurrection, it is believed that Peter, Jesus’ disciple, preached on its Southern Steps during Pentecost, experiencing the improbable wind and flame of the Holy Spirit, as chronicled in the New Testament book of the Acts of the Apostles. This is the site believed to be the very place where God instructed Abraham to sacrifice his only son. Because of this significance, these few acres in Jerusalem’s Old City are arguably the most disputed property on the planet, claimed by the unreconciled children of Abraham, father of the three most recognized religious groups in the world. Jews and Christians are welcome to wander freely—relatively speaking—through the spaces below the high ground of the Dome of the Rock. But while Muslims can enter through any of the surrounding gates that lead to their shrine, everyone else must enter through a single checkpoint. And, as our tour guide had prepared us, visitors were wise to follow certain protocols. Do not wear cross necklaces, or religious jewelry of any kind. Do not bring your Bibles. These things may be confiscated, or you may be denied entry. Women, dress modestly: make sure your shoulders and knees are covered. Be respectful. I am a rules-follower by nature, so I had followed these simple instructions. I wore no religious jewelry, and to save space in my suitcase, the only Bible I had brought with me on this trip to Israel was the one on my iPhone. I wore khaki capris and a black cotton shirt with three-quarter-length sleeves and a slight V-neck. Not only were my shoulders and knees covered, but so were my elbows! In spite of scorching sunshine and nearly 90-degree temperatures, I now suspected I should have worn a turtleneck. Soon the guard called his buddy over, who conveniently carried with him a variety of neck scarves for sale—a bargain at five American dollars apiece. As one of my equally culpable traveling companions pulled out her money pouch, another member of our group came jogging over to offer extra scarves. She helped to drape one of them around my neck, making sure to cover the offending bare skin. The guard indicated that we were now free to rejoin our group. We spent maybe an hour wandering the grounds surrounding the Muslim shrine. It was not a relaxing hour. Of the ten days we spent touring through Israel—from the Sea of Galilee through the Judean Wilderness and up to Jerusalem—this was the place where I felt the most unsettled. As our group paused to pose for a photo in front of the Dome, a group of 10-year-old boys came rushing by, blocking the view of our photographer and effectively disrupting the moment by tossing water on us. We watched as an orthodox Jewish man wandered the grounds in prayer, accompanied by both a Muslim guard and an Israeli police officer. We were told that this was a common practice. I sensed the hostility behind the stares of those who belonged, and I wanted nothing more than to return to the perceived safety outside these gates. 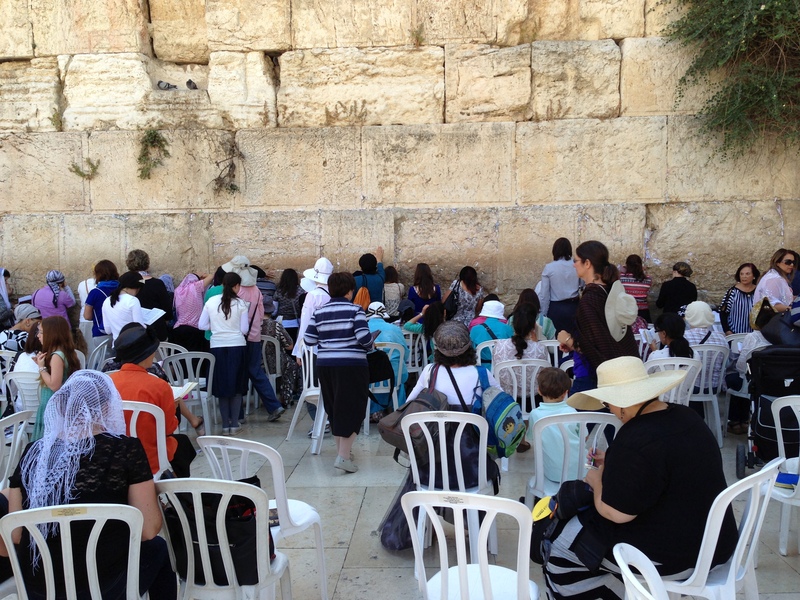 An hour later, I sat in a plastic chair facing the women’s side of the Western Wall. I watched those around me as they pressed hands and foreheads against the ancient stones and tucked scraps of folded paper into the cracks, scrawled prayers offered on behalf of friends who could not be present. I glanced to my left, toward the barrier between the women’s and men’s sides, my North American sensibilities questioning why it’s been deemed necessary to separate by gender to pray. I contemplated the tensions of the morning so far and still felt unsettled—a mixture of fear and anger and grief. I knew I was experiencing a microcosm of the spiritual divisions that define this tiny Middle Eastern country, and indeed, the world. We pray for the peace of Jerusalem, for peace on earth, for Yeshua to return. Amen. This entry was posted in Iconic Place and tagged Christianity, division, Dome of the Rock, Holy Land, Islam, Israel, Jerusalem, Judaism, peace, tension, western wall. Bookmark the permalink. It was an amazing experience, Nicole. Highly recommended! I’m due to travel to The Holy Land in January and am looking forward to seeing the places and learning more about the lives of those who live there still – so many people who find this land Holy!